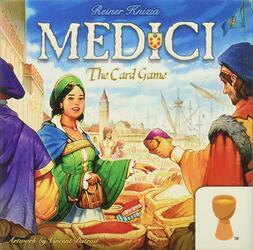 At the head of your fleet, become the most influential merchant of Florence in the 15th century! Load your ships with the most valuable goods, but always keep an eye open on the competition! Family remake of the classic game, discover the new pearl of Reiner Knizia, richly illustrated by Mr. Vincent Dutrait! Explained in 5 minutes, this game subtly mixes risk-taking, stop-or-again and collection mechanics ... and the 2 counts involved at the end of each round will force you to play fine! Fast, fluid, beautiful, taking the good taste of "come back", enjoying a price and a mini format ... This filler will animate your playful breaks for a long time!